Locked, but a notice said welcome to our church, you may step in and enjoy the peace or somesuch, so I guess they had already locked it. Pleasantly set in a a farmyard away from the road, looking its major restoration from without, but it sounds interesting within. It is actually at the edge of the village of Radwinter. My Reynolds and Darnall ancestors are from the parishes around here, so I pottered about in the graveyard for a while scanning names, though I didn't find anyone likely to be connected to my lot. I was taken by a sudden whim to head on to Sturmer and Birdbrook, both of which would surely have been locked for the night, and get the train from Bury or Sudbury. But I'd cycled sixty miles already, and to have tried to do more and to have boasted of having done so would have seemed mere macho posturing, I decided. Not to mention the fact that I was on my last legs, so fortunately sweet reason prevailed. I turned west again to Saffron Walden and Audley End station. 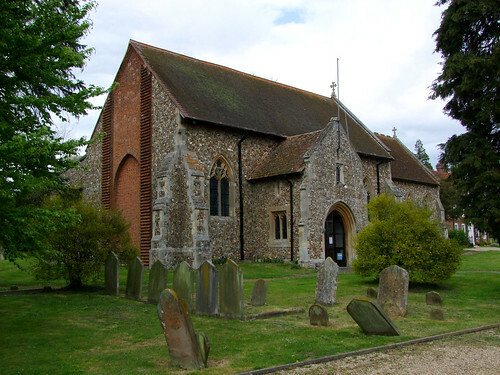 I'd already visited 17 churches, 13 in Essex and 4 in Hertfordshire, most of them open, though not all. It was the most churches I had visited in a single day for nearly a year.